Ultimate Privacy ~ NW Adirondack Region, Log Cabin, 16 Acres ~ Includes Kayaks! 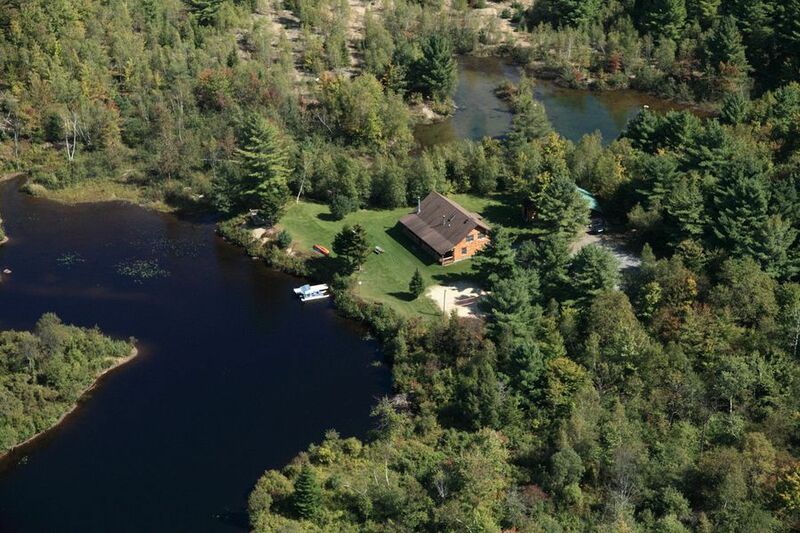 Ultimate privacy in this 2,800 sq' log home on 16 acres of wilderness waterfront. Located in the northwestern region of the Adirondack foothills, the Raquette Lodge sits on a section of Raquette River which has been dammed to create a pristine lake. The lake is excellent for swimming or fishing for pike, bass, walleye. The rent includes pontoon boat w/ 9.9 hp Mercury motor, free boat gas, 4 kayaks (2 single, 2 double), 2 paddle boards, dock, 8-person, jetted, lit hot tub at the water's edge. Regulation-size, lit sand volleyball court, In addition to the lake, there is a private pond ideal for skating in the winter. Also included are bon-fire pit (wood provided), BBQ and propane gas, Adirondack chairs and lounge chairs. Snowshoes provided in winter, snowmobile trails nearby. Fully equipped kitchen with place settings for large groups, modern appliances, Kitchen-Aide mixer, dining room with solid cherry table which seats 12, living room w/ 2-story cathedral ceiling, leather furniture, stone fireplace (wood provided). Upstairs den/TV room. Two downstairs bedrooms, one with king and one with queen bed, share a bathroom which also has a washer and dryer. The 2nd floor has a second bath, shared by two bedrooms, each with a queen and a single bed. The 3rd floor has a loft with 3 double beds, remote controlled skylights. Also there is an attached porch with waterfront and sunset views. There is a large fire pit surrounded by new Adirondack chairs and lounge chairs. Just added--a 2 car garage has been renovated into recreational building with regulation size pool table, shuffleboard table, ping pong table, foosball table, air hockey table, darts, assorted games--a great addition to an already fabulous recreational paradise! Sleeps 20, 1 king, 3 queens, 3 doubles, 2 singles, 1 futon, 1 pull out queen sleeper sofa. A/C units in bedrooms. 4 miles to Higley Flow State Park where there are acres of woods, trails, and swimming at a sandy beach. Disc golf course just across the water: https://www.facebook.com/SouthColtonDiscGolf. 25 minutes to St. Lawrence University, Clarkson College, SUNY Canton, and SUNY Potsdam. 1 hour to Lake Placid, site of two winter Olympics, and home of Whiteface Mountain ski slopes. 1.5 hours to Ottawa, Canada's capital where one can skate on the canals or visit Parliament buildings, museums, and cultural events. Events and parties are allowed with a $20/guest facility usage event fee. We will be happy to provide names of local caterers and tent providers. Sheets and towels are not provided but we can provide them for $12/set sheets and $9/set towels. Life jackets are not provided but can be rented from Adirondack Canoe & Kayak Co., 74 St. Rt. 68, just 2 miles from the Lodge. Donna and John Clark began their lodging business in 1994 with one room in their home which they converted into a bed and breakfast room. Now, almost 20 years later, along with some of their grown 7 children and 16 grandchildren, they own and manage 12 bed and breakfast rooms and 4 waterfront vacation rental homes. It is a family business that has brought joy to their family as well as to the hundreds of vacationers who have stayed with them. The privacy of this property is unmatched with its 16 acres of waterfront grounds; large groups are free to enjoy their vacation without fear of disturbing neighbors. It is a recreational paradise with pontoon boat, unlimited boat gas, kayaks, paddle boards, waterfront hot tub, lit volleyball court, adjacent game building with pool, ping pong, shuffleboard, etc. Built and equipped for large groups. Ultimate privacy. Many facets of recreation on grounds and nearby. Close proximity (1/2 hour or less) to St. Lawrence University, Clarkson University, and 2 SUNY schools make it a resource for conferences, visiting sports teams parents, etc. 4 miles away is Higley Flow State Park with sandy beach. The Beaver Pond Nature Trail has interpretive signs that describe the six distinct habitats through which the trail passes. Hiking trails double as cross-country ski trails in winter, when snowmobiling, snowshoeing and ice fishing are also allowed. NEW ADDITION, MARCH 2013: 2 car garage converted into recreational center! Bar size pool table, shuffleboard table, ping-pong table, foos ball table, air hockey table, darts, assorted games. We loved staying at the cabin. The kids had so much to do from the minute they woke up and the setting was beautiful. Also your quick response to any issue we had was much appreciated. Can't wait to come in the warmer months and stay longer. Thanks for sharing this with us! Thanks Donna! What a wonderful place this cabin was to spend the weekend with friends. We were very comfortable and stayed at the property the entire weekend. Of course our first night in it snowed over 12". This place turned into a winter wonderland. We spent quite a bit of time outside playing with the dogs and taking photos. The entrance was plowed quite early in the morning so nobody would have been stuck. Things we enjoyed most were the open floor plan and living space so we could all play games and hang out together. The fireplace was quite cozy. The cold weather did not keep us out of the hot tub. So nice to relax in the outdoors like that. Thanks again to Donna and John for providing us with a place to make memories! Your words are exactly why John and I and our family and staff continue to offer our homes for rent after 30 years of doing this--it is our delight to know we provide a small part in the making of memories! Thank you for warming our hearts!! Really incredible cabin! Such a fun stay! Would highly recommend! The place was awesome! Everyone in our party really enjoyed our stay and we would definitely stay there again. 12 of us had a wonderful get together at the lodge. It is an amazing place with a great rustic feel. You will enjoy finding all the various birds and animals in the lofts and on the walls. we went for a beautiful snow shoe, many pairs available for use at the lodge, and the games room was a hit. You will need to bring sheets and towels if you are from out of town and make the beds, and the loft is not suitable for adults to sleep in given the low ceilings. Would definitely stay here again. We are so glad that you had a wonderful get together at the Lodge! Thank you for sharing your experience to inspire others and to bless us. My family truly enjoyed our stay at this property. The game room and hot tub were great additions to the beautiful home.We also appreciated that my daughter and son-in-laws dog could enjoy the vacation too.